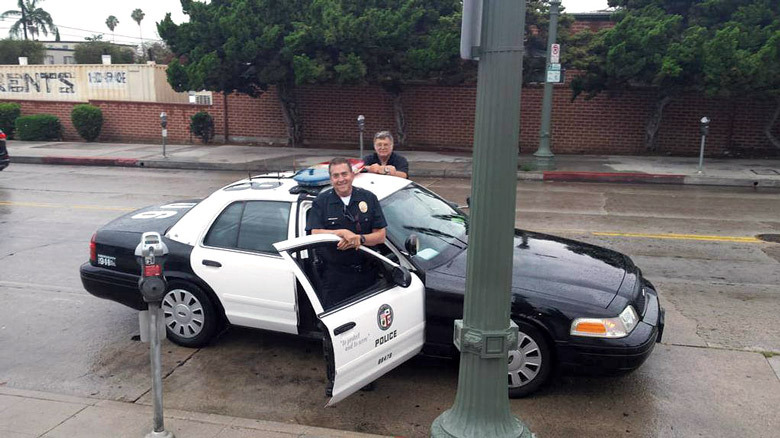 Reserve Officer Barry Jenner (passenger officer) with his friend and LAPD partner Garth Pillsbury. This photo was taken by Assistant Chief Beatrice Girmala a couple of years ago, when she was Deputy Chief of West Bureau. Reserve Officer Barry Jenner passed away on August 9, 2016. Officer Jenner served as an LAPD reserve police officer for 21 years, assigned to Hollywood Area. Hollywood was also Barry’s primary career: He had a long and successful résumé in film, television and theater, and was best known for his recurring roles in TV’s Star Trek: Deep Space Nine (as Admiral Ross) and Family Matters (as Lieutenant Murtaugh). His extensive list of TV appearances also included Another World, Barnaby Jones, Hart to Hart, Knots Landing, Remington Steele, Dallas, Days of Our Lives, Matlock, St. Elsewhere and Walker, Texas Ranger. Barry’s partner and friend, Reserve Officer Garth Pillsbury, told The Rotator: “Barry Jenner and I had been assigned to HWD for our entire careers: me since 1983, and Barry, I believe, since 1996. In 2005, we became Armed Level IIIs. At that point we were able to be assigned to a greater variety of duties and began working the hide car. Over the years, not only was he my LAPD partner but he and his wife became my close friends. “Barry was an accomplished actor. He knew that I had also done some acting and suggested I audition for a group that he was involved with, the Classical Theatre Lab. I passed the audition, and I’d see Barry and his wife at the theatre just about every week. This led to my being invited to their house every once in a while for parties and events, such as viewing the Academy Awards. And then there would be an occasional extra ticket to a play or film, even an invitation to a poker game. Barry was into poker, I must say. Barry was into golf. I think Barry had been into tennis in his ‘salad days.’ Ah, yes, and women. He managed to snag his beautiful wife, Suzanne. Or is it that she snagged him? “Barry’s philosophy regarding police work seemed to be: Let us build a trust between the Department and the citizens of Los Angeles. He struck me as one of those police officers that you’ve read about, who stop and offer a down-and-out person a helping hand, who loved to talk to and humor children. Officer Jenner passed away at Cedars-Sinai Medical Center from acute myeloid leukemia. The Los Angeles Police Reserve Foundation is very grateful to the Jenner family: In lieu of flowers, the family graciously requested that donations be made to LAPRF at www.laprf.org/donate.